Five film-makers from South-east Asia have been commissioned by National Gallery Singapore to make short films inspired by the art in its collection. Earlier this year, they went to view the institution's collection of South-east Asian art, of which there are about 400 pieces. Each then selected one to shape his theme for a five-minute film. The five short films will be compiled into an omnibus to debut at the end of the year, most likely at the Singapore International Film Festival, with other avenues for public access to be explored, says Ms Suenne Megan Tan, the gallery's director of education and programmes. "The film-makers selected the works that most resonated with them... It underscores how we believe that people can relate to art by bringing their own personal connections, to develop their own narrative," she says. Khoo picked the oil painting Portable Cinema, by Singapore artist Chua Mia Tee. The 1977 work was created for a calendar distributed by The Straits Times depicting vanishing trades. 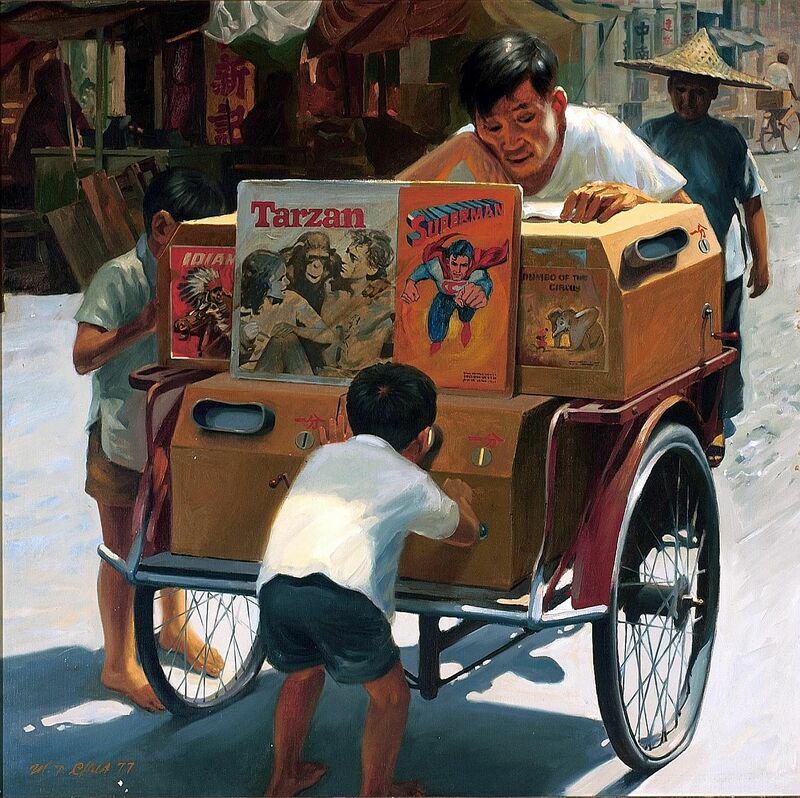 Chua drew a trishaw-mounted peepshow, a common sight in the 1940s. Khoo, speaking to the press at the National Gallery Singapore yesterday, talks about meeting Chua, 85, and asking him to describe what it was like to watch a reel, which typically featured a heroic figure such as Tarzan. "He loved to watch these little one-cent films. Just after the war, he would go to the cart, put a coin in and crank the handle. The reels would last two minutes, so he'd crank it really slowly, to stretch it to four minutes," says Khoo. Joko Anwar's film The Forbidden Door (2009) won Best Film at the Puchon International Fantastic Film Festival. He picked Wounded Lion, an oil painting from his compatriot Raden Saleh, created in 1839.